The prestigious Hopwood Creative Writing Awards were established in 1931 from a bequest of the will of Avery Hopwood, a University of Michigan graduate and one of the most popular and successful dramatists of his time. Hopwood left one-fifth of his estate to his alma mater, an endowment that now awards approximately $135,000 each year in prize money. Annual awards are offered to both undergraduate and graduate students in drama, screenplay, nonfiction, novel, short fiction, and poetry. Among the program’s most famous recipients are Robert Hayden, Arthur Miller, Frank O’Hara, and Marge Piercy. In addition to the prize ceremony, the Hopwood Awards are celebrated each year with a lecture delivered by a prominent literary figure. 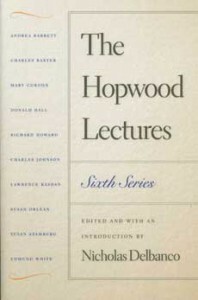 Past Hopwood speakers include such luminaries as Saul Bellow, Richard Ford, Louise Glück, Nadine Gordimer, Robert Hass, Norman Mailer, Joyce Carol Oates, and John Crowe Ransom. Their speeches have been collected in five previous volumes published by the University of Michigan Press over the past half-century: The Writer and His Craft: The Hopwood Lectures 1932-1952, edited by Roy W. Cowden; To The Young Writer: Hopwood Lectures, Second Series, edited by A. L. Bader; The Writer’s Craft, edited by Robert A. Martin; Speaking of Writing: Selected Hopwood Lectures, edited by Nicholas Delbanco; and The Writing Life: The Hopwood Lectures, Fifth Series, edited by Nicholas Delbanco. The present collection contains the ten lectures delivered since the last publication and includes work by Andrea Barrett, Charles Baxter, Mary Gordon, Donald Hall, Richard Howard, Lawrence Kasdan, Susan Orlean, Susan Stamberg, and Edmund White. The tenth lecture was delivered in spring 2008 by Charles Johnson.